Street food is on everyone’s lips; food trucks are lining pavements from Bangkok to New York and we show no sign of losing our appetite for them. This is great news for all of us hungry travellers who fancy tasty, imaginative food without forking out restaurant prices at every meal. Some cities have been serving residents on the go with deliciously simple fare, no knife and fork needed, since long before street food hit the spotlight though and you need look no further afield than Berlin to discover a city made for eating on the move. It’ll take far more than a long weekend to try all the incredible options on offer, but, don’t worry, we’re here to point you towards some of the must-eat dishes. 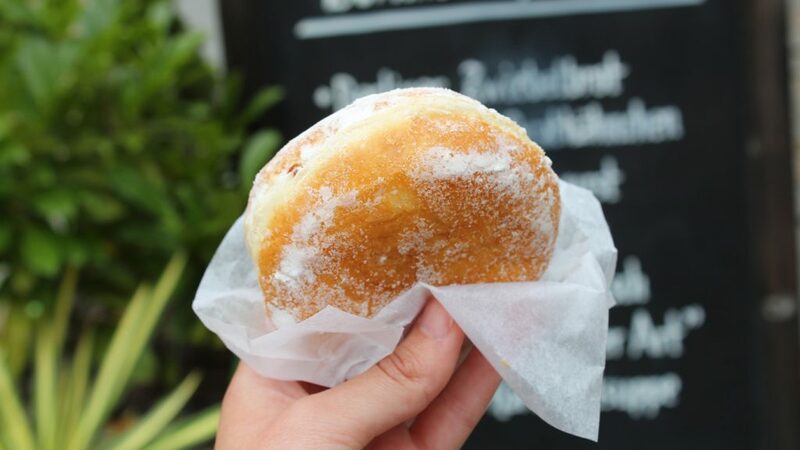 President John F. Kennedy infamously declared himself a doughnut in his “ich bin ein Berliner” speech, but confusingly it’s only outside the capital these delectable dough balls are called Berliners. If you want to follow locals’ example, ask for pfannkuchen. Although for extra confusion, ordering pfannkuchen anywhere else will get you a pancake! What is certain is that you won’t regret your choice, these are proudly old-fashioned and profoundly satisfying snacks: deep-fried and then either sugar-coated and filled with plum jelly or glazed and bursting with marmalade. You can get more modern twists on the classic, filled with chocolate, lemon or vanilla, but we’d seriously suggest going for the original. 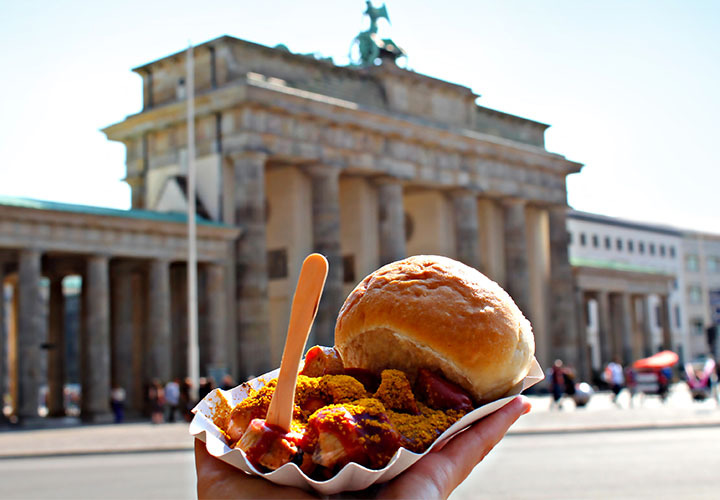 Sweet treats are all very well, but the honour of being Berlin’s best-loved street food is hotly contested between two real heavyweights: currywurst and the döner kebab. Now while the Insider Guide loves spending elegant evenings enjoying refined restaurant food in stylish surroundings, we can’t deny the pure finger-licking joy of tucking into a sizzling hotdog every so often. Back in 1949, local man and father of currywurst, Herta Heuwer, was clearly feeling inspired when he threw together a blend of ketchup, Worcester sauce and curry powder. Few would have guessed with such humble ingredients that he was creating a timeless classic, yet generations of Berliners can be thankful to him for his contribution to the city’s gastronomy! As for its opponent, in the blue corner we have the döner kebab. Now before you wrinkle your nose, it’s time to forget the downright unappetising versions you’ve may have regretted buying after an evening at the pub, we would never suggest you have one of those! In Germany, the kebab is an entirely different creature and a tempting meal for the completely sober too, we promise! Kadir Nurman, who moved to Berlin from Turkey, quietly revolutionised mealtimes when he invented the döner kebab in the early ’70s. He turned the traditionally prepared meat and salad of his homeland from a sit-down meal into one to enjoy on the go by serving them inside light and fluffy bread. And while others may argue that they were the inventor, it is undisputed that döner has become such an integral part of the Berlin psyche that huge queues snake themselves around the block outside the most in-demand joints daily. If you prefer your street snacks with less potential for mess, then the pretzel, or brezel, is the perfectly portable snack you’ve been looking for. While Bavaria may make its case for having the country’s best brezels, Berlin has no shortage of wonderful examples. Every bakery will sell you one, warm from the oven, crunchy exterior breaking open to reveal wonderfully airy dough. These perennials are joined each year by new innovations which gradually weave themselves into the culinary fabric of the city and will doubtlessly become equally as revered by locals. You can find food from every other corner of the world for sale at one of the incredible street food markets: from Street Food Thursdays at Markthalle Neun in Kreuzberg, Mauerpark on Sundays, Boxhagener Platz on Saturdays or Arminiusmarkthalle. 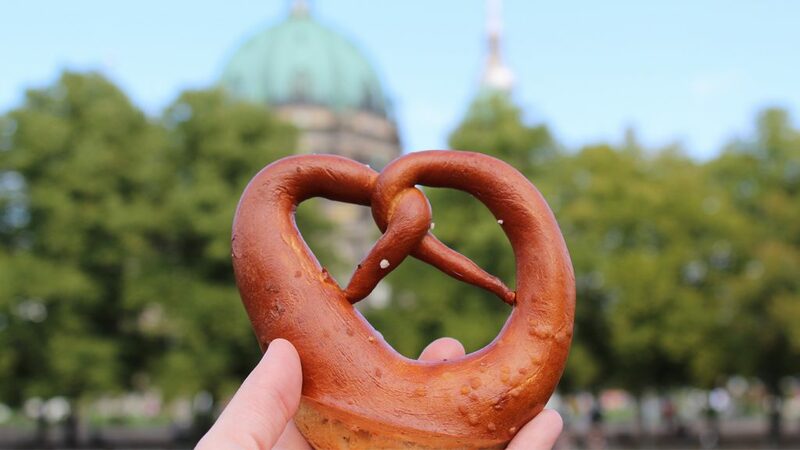 So, head to Berlin for a true taste of the action and get ready to join residents eating in the streets, squares and parks to soak up the city’s unique atmosphere and sample its street food icons.